OOPS brings program directors, school administrators, student leaders, researchers, and land managers in one place to discuss strategies for supporting students in wilderness pre-orientation programs. OOPS provides context for program development and growth, best practices, new program techniques, and nuts and bolts information that will help established and aspiring programs. At OOPS, you will have the opportunity to meet others in the field, access new research, and share and discuss program management. 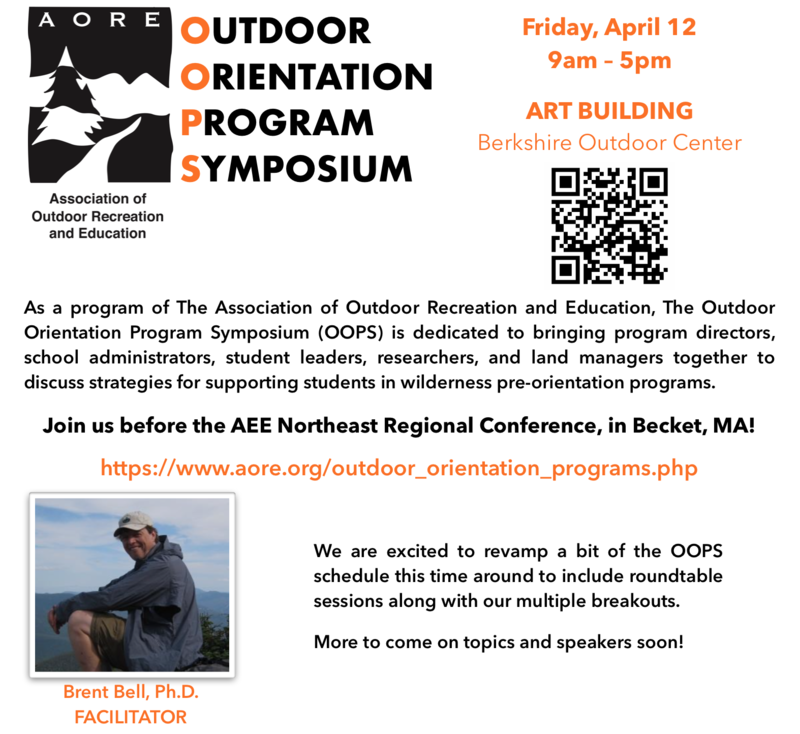 OOPS is dedicated to bringing program directors, school administrators, student leaders, researchers, and land managers together to discuss strategies for supporting students in wilderness pre-orientation programs. Every Symposium provides context for program development and growth, best practices, new program techniques, and nuts and bolts information that help established and aspiring outdoor orientation programs. Additionally, our spring programs tend to be more student leader focused (e.g., training other leaders, discussing curricular features, participant team building). Do you have resources to share with the OOPS community? Documents that make your program run? Links to helpful resources, or research and assessment tools? You can help others by sharing your knowledge! Send them to nationaloffice@aore.org. November 2, 2011 AEE International Conference Jacksonville, FL Carrie Lobman, Ed.D. April 15, 2016 AEE Northeast Regional Conference Becket, MA Karen Warren, Ph.D.
April 20-22, 2018 AEE Northeast Regional Conference Becket, MA Elizabeth Andre, Ph.D.